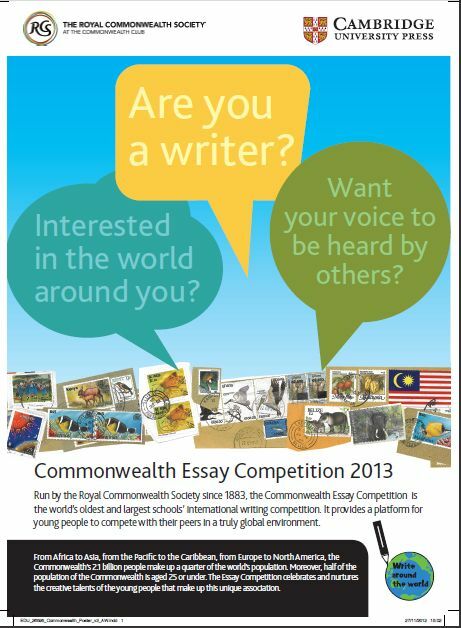 The Commonwealth Essay Competition is organised every year by Royal Commonwealth Society. 2013 Essay Competition now open! Entrants are encouraged to be creative in their response; answers can be submitted in a number of formats, for example: poem, letter, article, story or essay – the choice is yours! 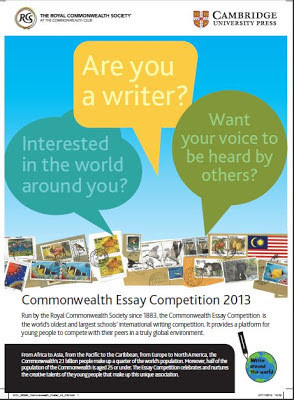 The Commonwealth Essay Competition 2013 is run by the Royal Commonwealth Society in partnership with Cambridge University Press. Entrants are judged in two age groups, Junior (under 14 years) and Senior (14-18 years) and must be living in, or a national of, a Commonwealth country. Certificates - resources for your school - flights to London - being invited to meet famous authors – taking part in expert workshops - work experience at international organisations - entries featured in worldwide media. 1. When has hard work paid off for you? 2. Creative thinking saved the day. country, continent or the entire planet. 4. Is change a good thing? 5. Are we too risk-conscious these days? 1. The Competition is open to nationals or residents of all Commonwealth countries and territories. 2. Special dispensation applies to entrants from Hong Kong, Fiji and Zimbabwe who are entitled to enter the Competition. 3. Entrants must select a Senior or Junior topic depending on how old they are on 1st May 2013. 4 Entries must be written in English and be the original work of the writer. 5 Entrants must submit an entry form alongside their entries and complete all the mandatory fields. 6 The maximum word-counts are 1500 words for Senior entries and 750 words for Junior entries. 7 Entries will be disqualifi ed if they fail to meet these requirements. Please note, etrants should only submit one essay to the competition, multiple entries will not be judged. 1. Entries must be the original work of the writer. This does not rule out input or assistance from others. However an entry will be disregarded if there is any suggestion of plagiarism or undue help from the internet or another person. 2. Entrants are encouraged to be creative in their response to a topic. Entries can be submitted in a number of different formats: for example, a poem, letter, article, story, essay or even a short play. 3. Entries must respond to the topic. Each year a number of good entrants let themselves down because they do not fully answer, or refl ect on, what the topic has asked them to do. 4. Award-winning entrants are expected to show originality and fl air, linked to sound academic standards and competent use of English as a written language. This includes a good standard of spelling and punctuation, neat presentation and clear hand-writing or word-processing. 5. Illustrations are welcomed, particularly in Junior entries, but they must enhance the written text and add to the overall quality of the entry. 6. Entrants should be aware that the care with which they present their work will be taken into account whether writing by hand or using a computer. The closing date is 1st May 2013 and results will be announced in the autumn of next year, when a Junior and Senior Prize Winner and Runner Up will be announced and our judges will make a number of Gold, Silver and Bronze Awards.